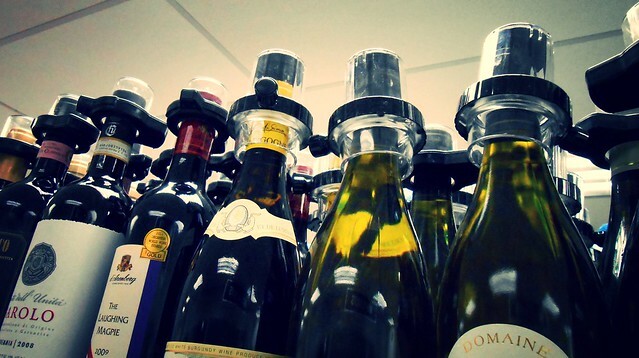 Plastic locks on the top of wine bottles displayed in a local store. 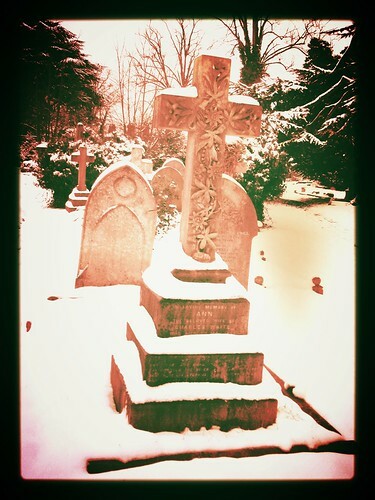 The graveyard at Cemetery junction in Reading town is a ‘Garden Cemetery’, designed and planted to enable visitors to promenade. Most weekends I’ll take a stroll around the cemetery, enjoying the natural peace and beauty and the wonderful sculptural art placed there as remembrances to people…. I’ve always admired the wrought ironwork on the porch of the London road side of the Gladstone club. It’s a grade II listed building. The listing mentions that in 1887 the house was the home of the recently founded Reading High School. It’s easy to notice the Gladstone club, without actually noticing it. 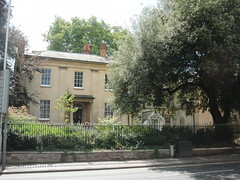 It’s a substantial building in a significant location facing out onto both Reading’s London Road and Kings Road. 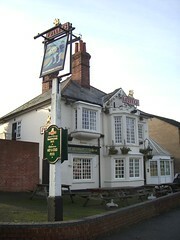 The club is next door to the Abbot Cook pub on the Cemetery junction on the southern edge of Newtown. Newtown is where the Huntley and Palmer factory employees lived. George Palmer lived on London Road in “The Acacias” about 500 yards west of the Gladstone club. An easy walk. Sadly, the Gladstone building now stands empty with a for sale sign on it. 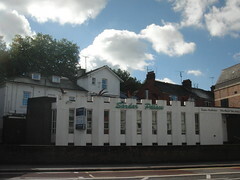 Until 2010 it was a delightful Indian restaurant and wine bar called the “Sardar Palace”. Now it looks forgotten, overlooked. Grass is moving into the gaps in the forecourt paving. 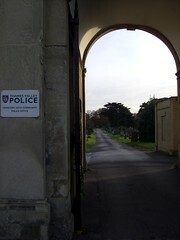 The wendy house is south of Cemetery junction. Newtown is north of cemetery juntion. My neighbour! Several friends live in Newtown. I bump into them when shopping in the local Co-op or in the local Abbot Cook pub. It includes a beautiful primary school that looks much as it would have done when it was originally built in 1864. 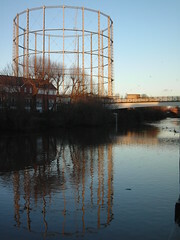 One of the most striking visual features of the area is a disused gas storage tower that can be seen from the river Kennet, the train lines, and at the northern end of cumberland road. 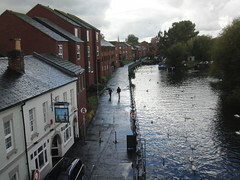 It’s diagonally opposite the Jolly Anglers pub. I find it strangely beautiful and peaceful. An architectural sculpture. 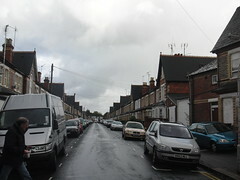 The remaining original housing in this area is mainly small terraced house’s with walled gardens and narrow back lanes. What I’d call ‘2-up, 2-downs’. Houses where you walk from the street, or forecourt, through the front door into a front room. A staircase goes to 2 bedrooms and the 2nd room downstairs was originally the kitchen where the fire was used to heat water for a tin bath. The toilet was outside the house – at the bottom of the garden. Newtown clearly includes some larger homes with forward facing gables more bedrooms, front gardens and downstairs hallways. Many of the buildings nearer downtown, to the East, were knocked down and redeveloped as social housing in the mid 1970s. Coinciding with the closure of the Huntley andPalmer business. The areas north of the Kennet and south of the Thames were developed with both private apartments for London commuter set and more modern social housing. It looks like this happened in the 1980s and 90s. The story went that H&P realising that the workers, not being quite so ‘religious’ would go to the pub anyway, and rather than have the drunk / hung-over they would control it. They supposedly gave out rationed tokens as part of the salary that could be exchanged for a limited amount of drink. Enough to wet the whistle but not get drunk! can you improve cemetery junction? Is it so gorgeous that any changes are more likely to ruin its existing gorgeousity? Is it so icky that people have given up hope of being able to improve it without first obliterating it? The question raises all sorts of emotionally charged, creative, cynical, optimistic, pragmatic and other reactions from people who live near, or pass through, the infamous local junction of the A4 (London Road) and A329 (Kings/Wokingham Road). A local councilor, Rob White, is working with local action groups to improve the Cemetery Junction area. At the moment he’s consulting with locals. The co-op has a big cardboard suggestions box decorated with a collage of magazine pictures of pretty things. Excellent stuff. It made me feel like being back at school where having a go was important, encouraged and easy. how about a cinema or a roller disco? What about an H Bomb? 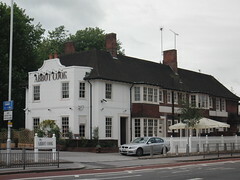 The Abbot Cook is a Mitchell and Butler pub at Cemetery junction in Reading town. You can see the Arthur Hill swimming baths through the window in the night-time picture. 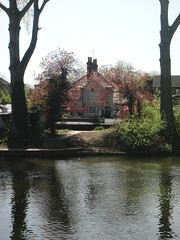 In this decade it has changed to the Abbot Cook from the Upin Arms and before that from the ‘Jack of both sides’. The pub appears to reflect and redefine the character of the area, charting social change. 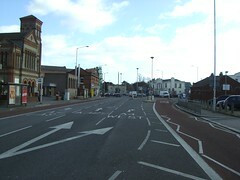 The Upin Arms used to court the custom of Reading town’s many students being placed half way between Thames Valley University buildings and the Reading University campus. It had the feel of a vampires lair where the vampires drank shorts and Lager. Only one ale available and it was not hand pulled. Dark, and possibly a bit dank, with a sticky carpet, loud music, TV screens playing sport or music videos, cheap microwaved food and long opening hours. Service was slow and surly. Recent Government cuts will inevitably lead to fewer and poorer students, their target customers are disappearing. The pub re-invented itself as the Abbot Cook targeting an altogether different customer. Hopefully it will appeal to my friends and family. The name ‘Jack of both sides’ refers to a proverb ‘jack of both sides, is before long, trusted by nobody, and abused by both parties.’ and to its physical location with entrances on two sides, towards two roads. According to some pub reviews it used to have trouble with drugs and violence. As the pub has moved to serve different segments of the community so the character of its location, Cemetery Junction, is gradually changing. It’s definitiely calmed down in its most recent incarnation. The Abbot Cook incarnation is named after a 16th century local Catholic Martyr, the Abbot of the now-rubble Reading Abby, Hugh Cook Farringdon. The pub serves overpriced average food (£9 for a chicken breast and some potatoes in a mushroom sauce) including some vegetarian options. There is a friendly, bare-parquet-flooring with authentic victorian furniture, church-candle riddled, warmth to it’s atmosphere. 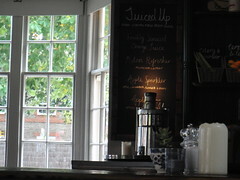 It has about 4 real ales on tap, they pull pints into jugs and have oversized stemmed glasses for half pints. Oh! 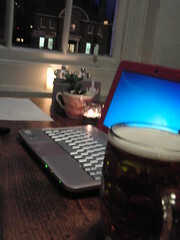 I felt all girly drinking a half pint, never again. The staff don’t know what a slieve glass is, but they are phenomenally polite, cheerful and helpful. One bar man spent nigh-on half an hour talking to be about Mitchell and Butler and the different chains of pubs they own. I’m guessing he’s on the management trainee track. It has a supportive and friendly atmosphere. Like me it’s pleasantly quirky – succulent plants in teacups decorate each table. There are also some double sockets for the cupboard and her companions. My local pub has become somewhere I want to go. Ricky Gervais and Stephen Merchant’s first feature film is named after a place in Reading called ‘Cemetery Junction’. “A 1970s-set comedy centered on three upstart professional men working at an insurance company” staring Ralph Fiennes. I haven’t noticed the film cameras locally. The cat ate my homework. I can’t get my computer to work. Washing machine, drains, pipes, roof, (replace with home-feature of choice) is broken and I have to wait for the repair-person. Aliens have surrounded cemetery junction. Singing and high spirits in the streets near cemetery junction, Balloons tied to fire engines, lamp-posts, leaple and shops. Police directing traffic and cycling aound, smiling. A yound boy offered me bottled water and a leaflet. 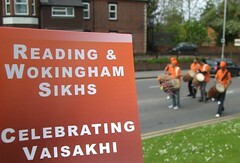 I took the leaflet and read… …Nagar Kirtan is a Punjabi term that literally means “neighbourhood hymn singing“. 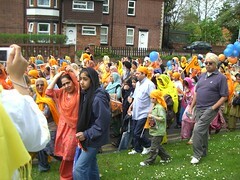 The seek new year is April 14th, the day that Sikhism was born in 1699. It is the holiest day of their calendar. wandering around as if they own the place and no way-out except using the pedestrian crossings across the A4 or A329. Neither crossing to be taken-on lightly by even the most hikingly-well-equipped-human.